If you have hand numbness and tingling in your ring and small finger that comes and goes during the day and that wakes you up at night, then you may have a condition called cubital tunnel syndrome. 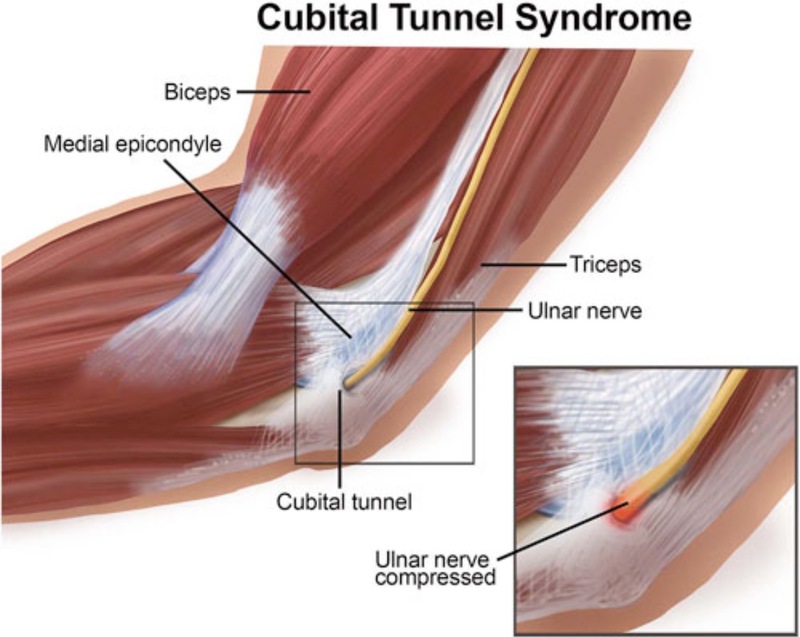 Cubital tunnel syndrome, also known as ulnar neuropathy, refers to compression or irritation of the ulnar nerve at the cubital tunnel. The cubical tunnel is a 4 millimeter passageway between the bones and tissue at the elbow through which the ulnar nerve passes. The ulnar nerve is one of the three major nerves in your arm. It runs from the neck to the shoulder, down the back of the arm, around the inside of the elbow and ends at the hand and fingers. The ulnar nerve supplies feeling and movement to parts of the arm and hand. 1.) Compression – caused by habitual activities such as leaning your elbows on a hard surface and bending the elbow for long periods of time (such as during sleep). The elbow joint provides little padding, so the nerve is more at risk for compression. Additionally, tissue surrounding the nerve may become thicker through injury or the muscle may become larger, compressing the nerve at the elbow. 2.) Abnormal bone growth or fluid buildup in the elbow or from physical activity that puts pressure on the ulnar nerve. 3.) A direct blow to the groove of the elbow that can hit the ulnar nerve. When the ulnar nerve becomes pinched or irritated, it can cause pain, numbness, and tingling in the elbow that can extend into the ring and small fingers, especially when the elbow is bent or pressure is applied (such as leaning on a hard surface) for extended periods of time. In more severe cases, loss of strength in the fingers and a decreased ability to grip with the hand or fingers may also develop. If the nerve has been compressed for several weeks, muscle wasting or locking of the hand in a claw-like position can occur. 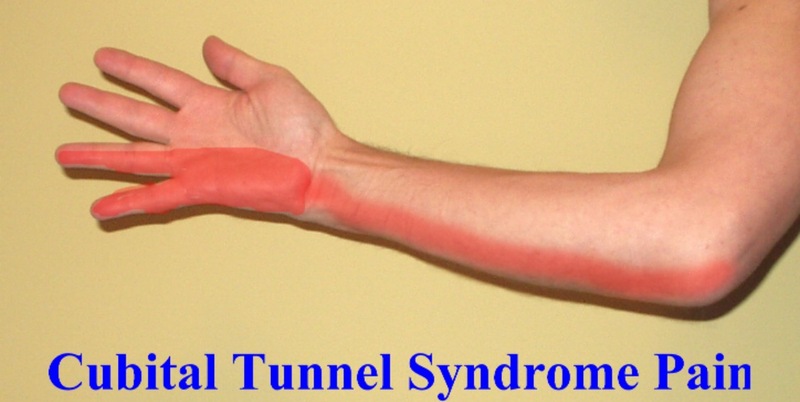 Three in every 10,000 people will develop cubital tunnel syndrome in their lifetime. Women tend to have it twice more often than men. Cubital tunnel syndrome can be diagnosed by a patient’s history and examination of the arms and hands. On occasion, X-rays may show a bony spur at inner aspect of the elbow. Ultrasound may show thickening of the fascia that overlies the nerve and/or fluid within the ulnar nerve. Nerve conduction/electromyelography may show slowing of electric signals traveling down the nerve from the neck to the hand. Magnetic Resonance Imaging may show a mass in the groove in which the nerve sits. Activity modification: Avoid unnecessary pressure on the elbow during daily activities that may be causing your elbow and hand numbness or tingling. Anti-inflammatory Medication: Medications like Advil®, Motrin®, Ibuprofen, and Aleve® can help to reduce the inflammation along irritated nerve. Please use these medication as directed on the package. You should eat something when taking these medications as you may be at risk for an ulcer in the stomach if you take them alone. If you tolerate these drugs well, then take it daily for two weeks and then discontinue for one week. If symptoms worsen or return, resume for two weeks, and then stop use of these medications. Bracing: A nighttime extension splint will help to keep the elbow from bending (such as during sleep). Wearing a pad over the elbow would help blunt the force of a direct blow to the groove of the elbow that can hit the ulnar nerve. Physical Therapy: Nerve gliding exercises and modalities like ultrasound and electrical stimulation for the arm and hand can also help to decrease pain associated with cubital tunnel syndrome. Local steroid injection: If your pain remains bad despite the aforementioned conservative measures, a steroid injection may provide some relief. Steroids help to reduce inflammation. Sometimes two or three injections are tried over a period of weeks, if the first injection is not effective. However, even multiple-rounds of steroid injections may not work. Also, steroid injections do carry some theoretic risks, albeit rare, including weakening surrounding elbow tendons and ligaments and causing shrinking of fat that would otherwise help to pad and cushion the nerve. Surgery: Surgery is advised if your pain has not eased after six months despite more conservative treatments. The operation releases the Osborne’s ligament which is the ceiling of the cubital tunnel and may involve removal of the bony groove that forms the floor of the cubital tunnel. This increases the space of the tunnel and relieves pressure on the nerve. In some cases when the nerve is unstable after it is released, the ulnar nerve may need to be moved into a new location in front of the elbow joint. Prevention: Obesity and diabetes have been recognized as a risk factor for cubital tunnel syndrome. Healthy lifestyle choices may help to prevent its development. People in occupations that require holding the elbow in a bent position should be encouraged to perform consistent position changes to take stress off of the ulnar nerve.